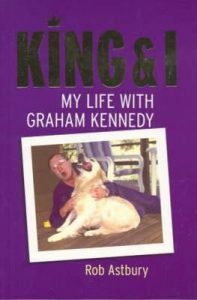 King and I : My Life with Graham Kennedy - I.M.T. Graham Kennedy collected around him some of the brightest talents of the Australian entertainment industry. For two decades high-flying sports journalist Rob Astbury was at the center of that circle, sharing Kennedy’s bed and his bleakest moments. For years Astbury refused all financial incentives to tell his story, but now he reveals what life was like with Graham. Graham Cyril Kennedy reigned for three decades as the undisputed king of the world of Australian television. Beloved of mums and dads across the nation, he enjoyed virtually limitless power, wealth and fame. But lurking behind the facade of rapier quick repartee and bug-eyed joviality was a dark and twisted soul. Cruel, vindictive and wolfishly self-obsessed, Kennedy was obliged to conceal his sexual preferences at a time when being openly gay meant professional suicide. This ongoing denial, combined with an inhibited and unhappy childhood, gave birth to a bitter and suspicious nature. He was a man who opened himself up only to a minute circle of confidants. This will be a ‘no holds barred’ account of their lengthy relationship where Astbury reveals a frightened, often vicious, occasionally tender, control freak.